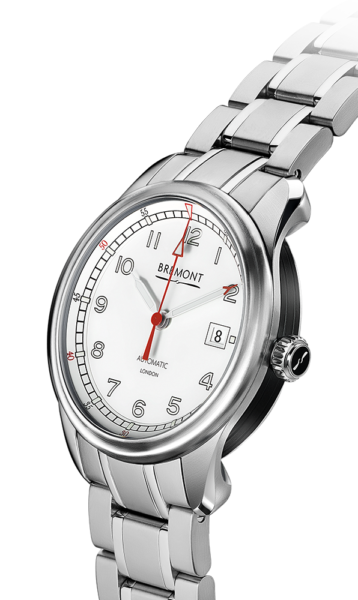 BE-92AE automatic chronometer with 38-hour minimum power reserve. 40mm Hardened stainless steel of Bremont Trip-Tick®construction. Water resistant to 10 ATM, 100 metres. Stainless Steel. The AIRCO model is named after the 'Aircraft Manufacturing Company Limited', one of the first British military aircraft manufacturers. The watches are constructed using Bremont's technical three piece 'Trip-Tick®' cases which are produced at the company's facilities in the UK, housing the smaller but beautifully finished chronometer rated BE-92AE movement. The new AIRCO MACH 1 boasts a satin finished case, a military inspired back dial offset with a sweeping orange second hand, and comes on a vintage brown calf leather strap.